After recently selling his multimillion dollar, Bay Area-based defense technology company DB Control, Peter Dahl, 54, moved back to his hometown of Santa Barbara only to find himself feeling “empty” after having run his own business for more than 30 years. So he was on the prowl for the next move when, in March, Dahl heard that the annual Game Developers Conference was taking place in San Francisco. He quickly called his nephew Leif Dahl, who was into video games, and the recent Chico State graduate happened to be working at the conference as a volunteer. The two got to talking, and just one month later, they launched Techtonic Games, Santa Barbara’s first video game development company. At first, the elder Dahl wasn’t sure if video games were for him. “I wanted to sink my teeth into something substantial, having already done military electronics for 30 years,” he explained. But the idea of it being a family business grew on him, so he funded the project, leaving Leif in charge of putting together a team of programmers, artists, audio specialists, and game designers. In no time, eight Chico State grads relocated to Santa Barbara to start the company. 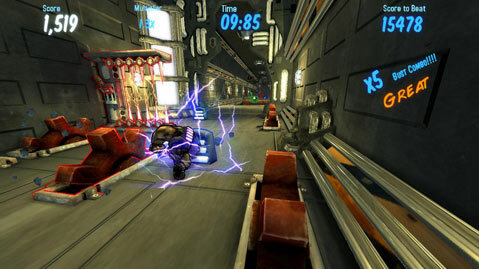 That office is on upper State Street, where the team is now putting the finishing touches on the company’s very first computer game: Bust-n-Rush. The fast-paced, smash-up action game follows a man named Kovo, who just wants to enjoy life with his pet flamingo Paco until the evil villain known as The Satellite of Wub ruins everything. The game follows Kovo on his quest to destroy the bad elements. It only took one week for the team to have a working prototype of Bust-n-Rush ready. Audio designer Catherine Arthur created all of the music and sound effects in creative ways, such as smashing pans together and throwing bags of dog food against a wall, to get a specific sound. “The sound effects and music in a game are very important for the players’ experience,” said Leif. And it may come full circle this spring, for Techtonic Games submitted Bust-n-Rush into the Independent Game Festival, the results of which will be announced at next year’s Game Developers Conference in San Francisco.